This blog turns three years old today—it started as a new year’s resolution I made in 2008, and it’s the only one I’ve kept for so long. In all the time I’ve been blogging I’ve heard background chatter that blogging is a dying if not dead medium; the most popular blogs now look more like websites for mass-media properties, and a lot of what would fit best on a blog a few years ago now gets Tweeted or Tumblr’d. It may say something about our culture that we talk often about how books matter less and less, while we sign up for tools that offer subtle gradations of saying things briefly. But the book still lives, as an idea if not always as a business proposition. And as for blogging, well, I’m stubborn, through the baby fog and all the rest, for the same reasons I gave last year. Blogging makes me a better reader, and though I do Tweet and (very rarely) use Tumblr, only here can I work out the kind of thoughts I can’t compress into 140 characters but which aren’t quite ready for prime time (i.e., a published review). I blog less than I used to, but, I think, with more of a purpose now: Though I swore to myself when I started blogging that I wouldn’t write what would formally qualify as a “review” here, these days I’m more interested in expanding on ideas contained in individual books or stories, either riffing on something I’ve written for print or exploring ideas that would be hard for me to summarize in a 600-word assignment. If I’m disappointed at how much word counts have diminished since I began writing book reviews for publication (oh, jeez) 15 years ago, I can’t complain that I lack the space to say what I’m thinking about. Here, the only limitations are available time and, perhaps, a good editor, still one of the benefits of writing for publication. But if I don’t have a backstop, I’m not doing this entirely alone. The comments, email exchanges, and personal conversations I’ve had as a result of this blog have been profoundly important to me, and that in itself is a reason to keep doing this. As always, thanks for reading. 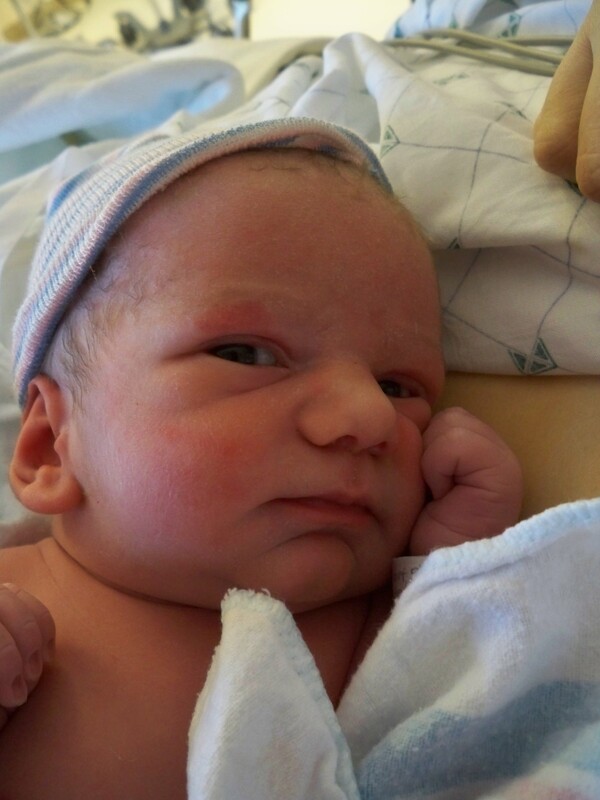 That pensive fellow up there is Daniel Neidorf Athitakis, who was born yesterday. He’s doing fine, as is his mother. Me, I’m a bit sleepy but mostly just over the moon over this kid. I’m sure it’ll be a little while before I get back into a regular groove around here, but a bit of a break might not be such a bad thing. Regardless, I imagine that I’ll try to sneak in as much reading as I can between feedings, changes, and other parenting duties. Talk to you soon. I’ll be offline for the next few days, though I may show up on Twitter on occasion. In the meantime, please consider studying up on the Advanced Genius Theory (Jason Hartley‘s thoughtful responses to my post deserve a response as well, and I’ll get to it soon), or take a look at some of the Q&As with literary websites I’ve been conducting for Critical Mass, the blog of the National Book Critics Circle; better yet, spend some time at the sites featured in the series. Posting will resume around the middle of next week. As always, thanks for reading. Unfortunately, I haven’t been able to entirely escape the ill effects of the winter weather that has been punishing the Washington, D.C., region for most of the past week. My home phone and Internet connections are currently down, and the prognosis for when they might return is somewhere between a few days and few weeks. I’ll likely be able to post on occasion until my Internet access is restored—if, for instance, I can plant myself for a little while at a Wi-Fi-enabled cafe like the one where I’m writing this. But whatever it is you come here expecting, expect less of it for a bit. Thanks. Today is the second anniversary of this blog. I thought about commemorating the date by linking to my very first post, but I’d rather not embarrass myself, or waste your time—much of what I blogged about then would barely rise to the level of a Tweet now. That says something about how much about how much blogging has changed in a short 700 or so days, and indeed you don’t have to look far to find people who’ll tell you that blogging is a dying if not dead exercise. But I persist, because doing it still satisfies the chief goal I set for myself when I started—to become a better reader. When I began, I figured I’d spend, say, six months or so minding my own business until I figured out what I was doing, then make some kind of announcement about the project. Of course, the literary blogosphere is too tightly knit to let you mind your own business for very long; I received a nice note by A Prominent Litblogger less than a week in. That’s a happily unexpected side-effect of blogging: Doing this has introduced me to a lot of smart people I wouldn’t know otherwise, and helped start a few friendships as well. That, too, is a reason to keep going. As for “figuring out what I was doing,” nuts to that—I gave up on that along time ago. I have a few tics and routines, but as a general rule I click on “new post” not exactly sure about where I want to go. (That’s probably painfully obvious sometimes, but I make no great claims for the quality of this enterprise—these are just “notes,” remember.) What’s flattering is that so many people have shown up, and are willing to watch me work it all out in public. Thank you for reading. People who read this blog via RSS won’t notice it, but for a little more than a year I’ve maintained a page on this site dedicated to book readings and signings in the Washington, D.C., area. The format is admittedly clumsy, but I’ve tried to make the listings fairly comprehensive, and the page is easily the site’s most-read individual page. However, these days I think more and more about sunsetting it. I’d miss maintaining the page if I just stopped doing it. It’s a good way to keep up on who’s planning to come to town, and assembling it occasionally tips me to some important changes in the D.C. bookselling scene. If I hadn’t been updating the page this morning, for instance, I wouldn’t have come across the sad news that Lambda Rising, the District’s pioneering GLBT bookseller, is closing its two stores. But there’s no getting around the fact that doing this is fairly time-consuming, and that there are other places that do this sort of thing with a lot more tech-savvy. So if you like the listings and would like to see them continue, now is the time to speak up and let me know. I’m not (just) fishing for encouragement—I’d like to hear thoughts about what would make the listings better and more useful. Fewer listings with more specific information? Comments and/or brief reviews? More outbound links? If the listings are meaningful to you in any way, please leave a note in the comments or send me an e-mail. Regardless, thank you for taking the time to read this site.